In 2009 the United Church of Canada passed a resolution to celebrate Creation Time in the Season of Pentecost. During this period we celebrate the fact that Creation is an important part of the whole Christian year. Creation Time recaptures the ancient Christian Ember Days which were originally tied to the birth and growth of crops. 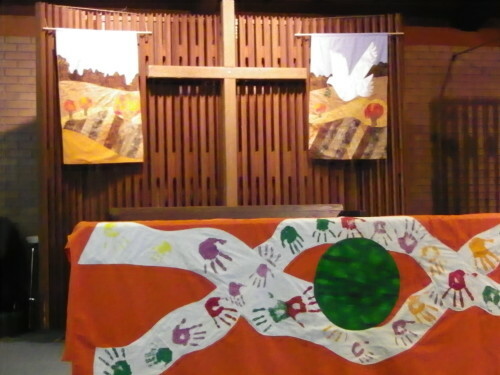 The banners for Creation Time were created by Linda Stewart, Tanya Montebruno and Eleanor Lwiwski and dedicated in memory of Linda Will on Thanksgiving Sunday, October 13, 2013. 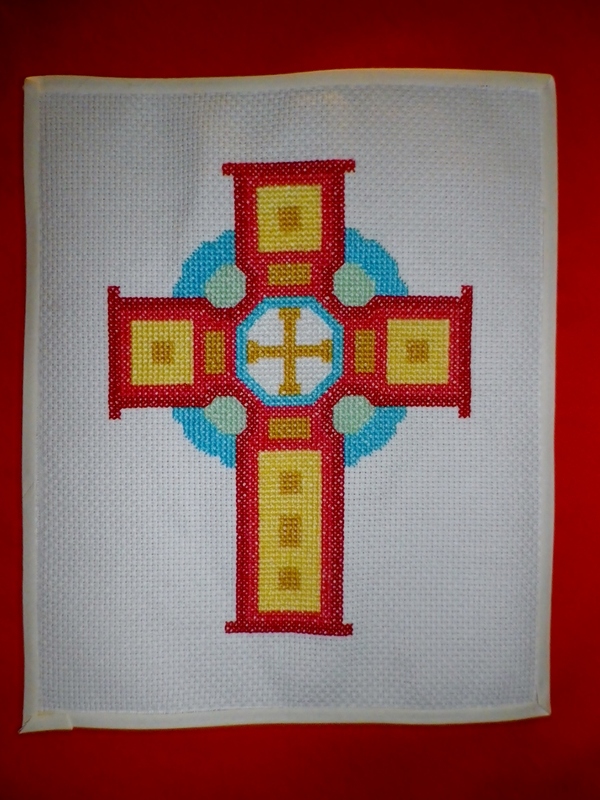 The symbol of Creation Time from the United Church shows an Elm Tree – a symbol of faithfulness; a Blue Circle – the symbol of God’s everlastingness and eternity; a Gold Alisee Pattee cross that represents the holiness of life and a Square that recalls God as Mystery. 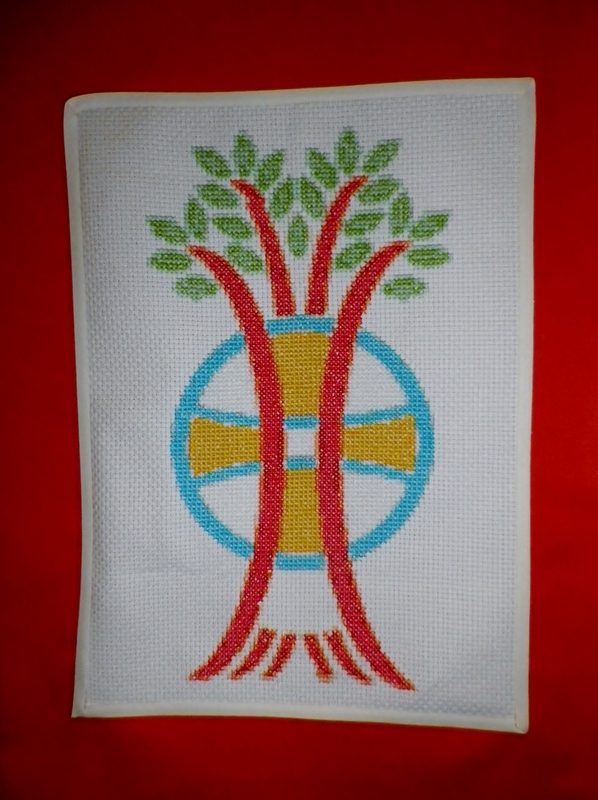 The two antependia are done in cross-stitch. Looking at the antependia we see that orange is the chosen colour. It represents the conquering of sin, a time of harvest and the strength of autumn. 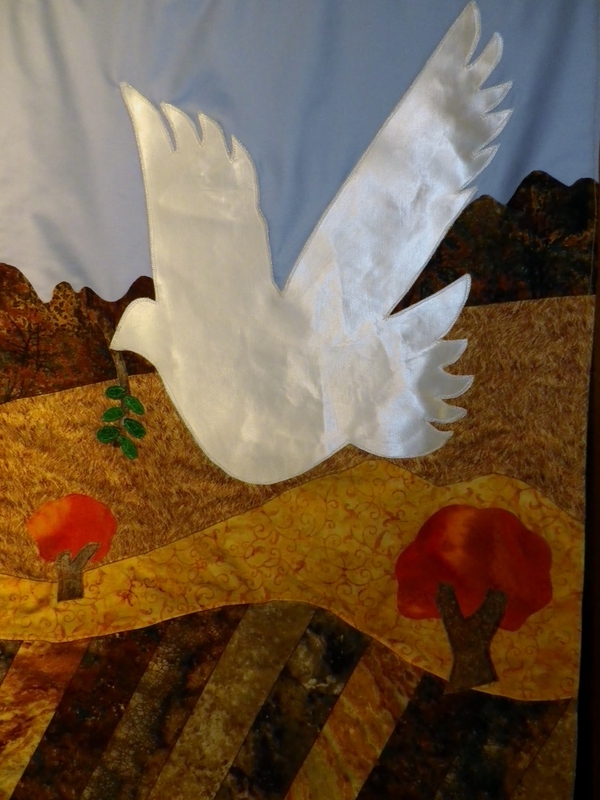 In the hangings beside the Cross we have elm trees, fields and a dove; all symbols of Nature, God’s Creation. 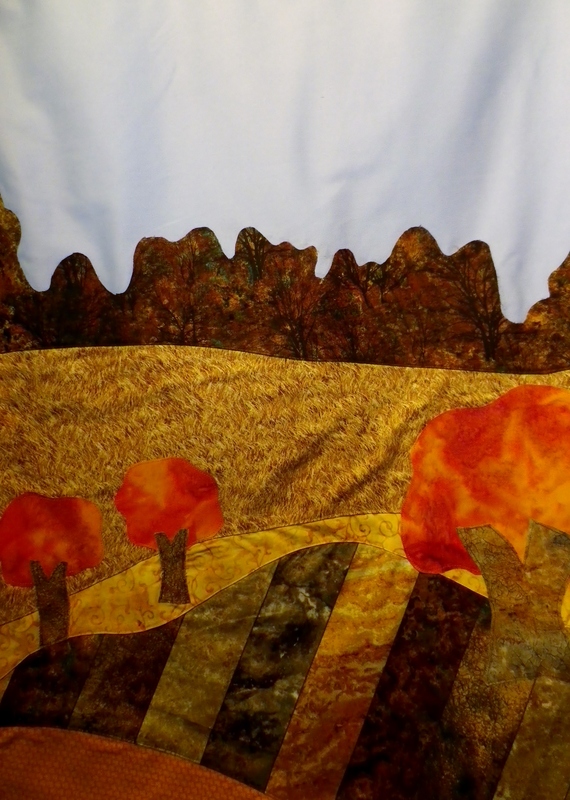 These banners are done in applique. 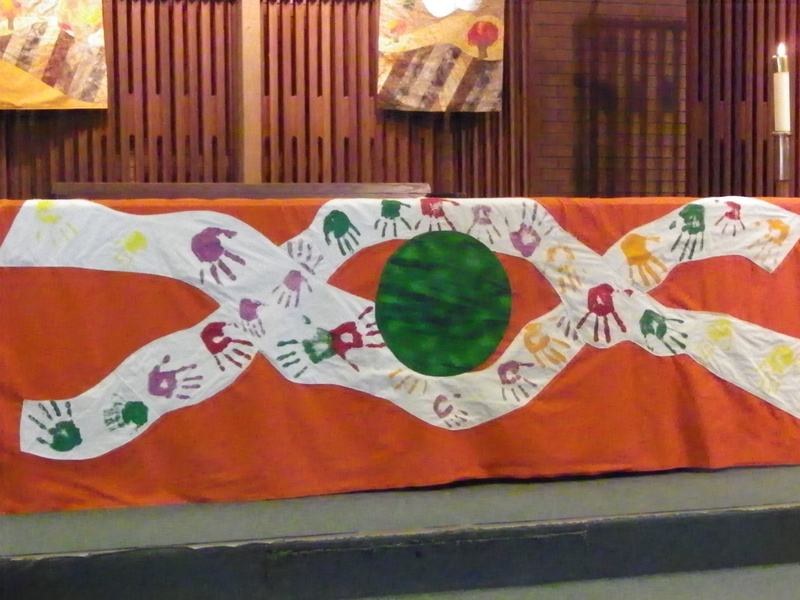 For the table cloth we used handprints from the Sunday School. This idea was taken from a project started by Linda Will. The hands encircle the earth. The ribbons loosely copy the Christians Fish symbol. The tablecloth was created using fabric paint and applique. We receive these beautiful cloths for our sanctuary made with great skill and much love in memory of Linda Will. They will brighten our worship and remind us of God’s glorious creation. They will call us to celebrate the gifts of this church family that we discover in us, young and old, new and long-time, wise and still learning. There is room for all God’s children in this place. This is Linda’s legacy to us for which we are so thankful. One: Will you receive this gift given in love and faith? All: With humble thanks we accept this gift. One: Will you search it for the inspiration to live more bountiful lives as disciples of Christ? All: We will honour Linda’s memory, the love of her family, the devotion of her friends, and the call to live with justice, mercy and grace. One: May God be praised.